Woman and jewelry have always formed a great combination. A wedding day or also a normal day is just incomplete without some accessories. Before you start picking up the jewelry you need to keep a lot of things in mind, many people do not know the different types of jewelries or get confused between different types and end up buying the wrong one. A lot of things are kept in mind before designing the jewelry, the theme as well as the color of the jewelry is taken into consideration. Let us discuss the five most popular types of jewelries so that the next time you step out, you will be confident enough that you are buying the right type. Jewelry with different studs and stones are quite popular amongst Indians. Why they are so popular? It can be to acquire that classy look or maybe as many people believe there are some spiritual values attached to such stones. But most importantly they are very popular and fall in the vintage category because of their lustrous look. Fashion jewelry, it is the evolution of the costume jewelry. This kind of jewelry keeps on changing constantly matching the new trends. Many fashionable women prefer this type of jewelry over higher prices as they might want to spend less money on jewelry that is in trend for a short period of time. The jewelry which is not in mainstream production and of which the mode of production is no longer popular. This kind of jewelry has dull and rough look, combined with an old world. This is the most emotive and personal of all the decorative arts, offering a unique insight into the values and aspirations of a society. 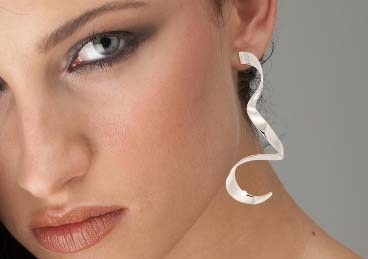 Silver Jewelry, is quite popular amongst Indian women. Ornaments made of silver, such as rings, bracelets, chains, necklaces, nose rings, earrings, toe rings, heavy kadas, and armlets, form integral part of Indian jewelry. It is a precious white metal which is highly conductive and malleable. Because of its softness and receptiveness to polish, silver was notably first used during ancient times to create tableware with intricate designs and a mirror-like shine. Handmade jewelry, as the name describes it is a kind of jewelry that is made by hands with no use of machinery, a major chunk of this jewelry in the country is made by independent craftsmen. Traditionally also, a significant part of jewelry manufacturing has been handmade jewelry. Creating a piece of jewelry involves making many decisions. You will have to choose your colors, your style, the size of your piece and more. One thing that often gets miss is the type of jewelry clasp you decide to use. There are many options to choose from and some are better suited for certain projects than others. So, now you can choose your type of jewelry.